The bacterial translational elongation factor EF-Tu is a GTPase, which plays a crucial role during the synthesis of proteins in bacteria, as the factor transports the amino acids that build up a cell’s proteins to the cellular protein synthesis factory, the ribosome. Previous structural studies using X-ray crystallography have shown that EF-Tu occurs in two markedly different three-dimensional shapes depending on whether the factor is “on” (i.e. bound to GTP) or “off” (i.e. bound to GDP) (Figure 2). The binding of GTP/GDP have therefore always been thought to be decisive for the factor’s structural conformation. However, a research collaboration between researchers from the Department of Molecular Biology and Genetics at Aarhus University and two American universities reveals that EF-Tu’s structure and function, and probably also those of other GTPases, are far more complex than previously assumed. 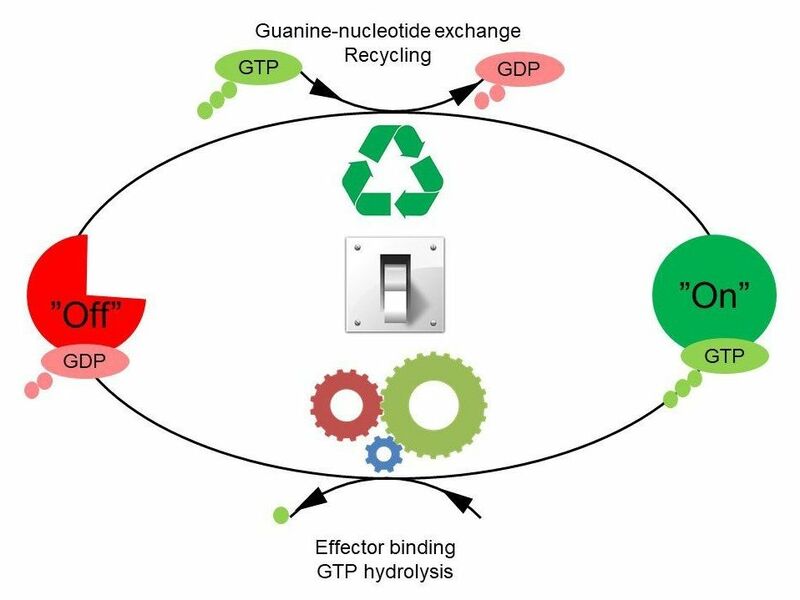 In Søren Thirup’s group, X-ray crystallographic analysis of E. coli EF-Tu has shown that EF-Tu bound to a variant of GTP, GDPNP, can also occur in the “off” state, which is characterised by a more open structure. In collaboration with American researchers, Charlotte Knudsen’s Ph.D. student, Darius Kavaliauskas, conducted further studies using a special form of fluorescence microscopy that makes it possible to observe the spatial structure of individual EF-Tu molecules in solution.